A word to the wise. Whether their concern be pediatrics or geriatrics, whether they crawl on hands and knees and wear diapers, or walk with a cane and comb their beards: There's a special Magic to the battle royale. An uncanny sensation reserved for the motley crews who engage in its ravaging diplomacies. Our destiny is not to sit in the rubble of our making but to reach out for whatever perfection that is to be had. 93/94 seems to be thriving. There are tons of reports and pictures out there of masses gathered playing Old School. I couldn’t help but notice that it all seems aimed towards one-versus-one matches. In an era where Commander is immensely popular, I was surprised to embark on so few tales of multiplayer old school magic. How come? Hi, my name is Dyan de Rochemont (1980) and I’m a Magic player from The Netherlands. 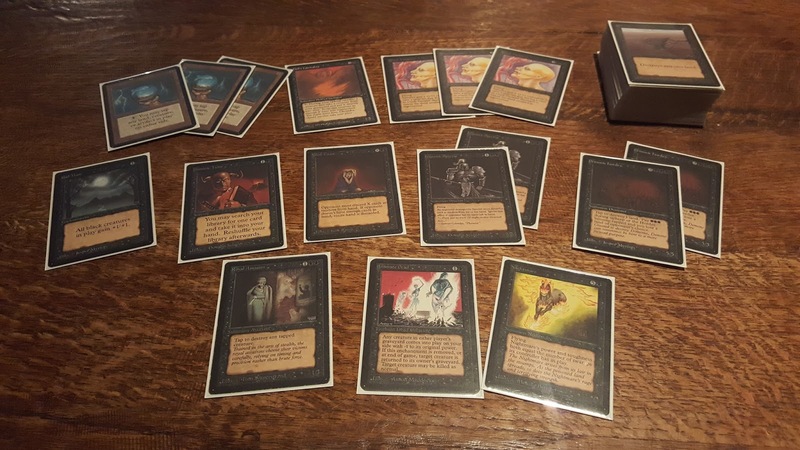 About a year ago, I stumbled upon this blog and actively picked up playing Magic again because of it, after an idle period of nearly two decades. Now in turn, I’d like to try and give back by contributing some myself. I’d like to muse some about what Magic meant to me in my early days and how 93/94 abruptly dragged me back into it. 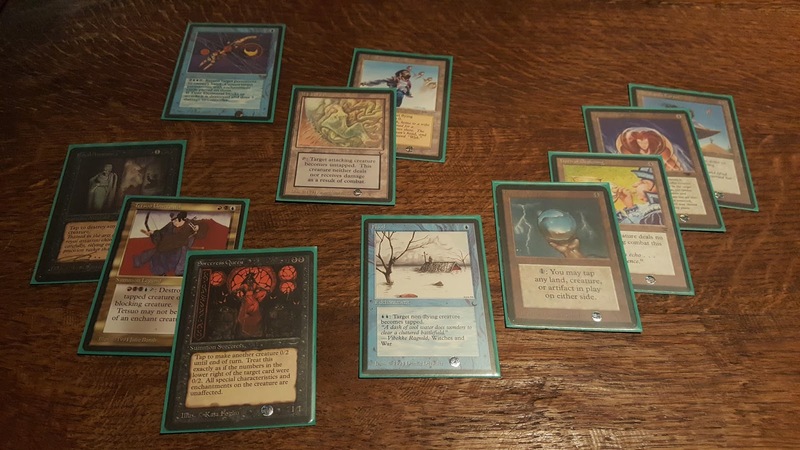 And last but not least, how I nowadays enjoy playing a homebrew multiplayer variant with my playgroup: 93/94 EDH aka Old School Commander – of which I’ll subliminally try to enthuse you to try it too. As a teenager, I started playing Magic during the summer of 1995, having Fourth Edition and Ice Age freshly hit the stores. Fallen Empires was still on the shelves. My friends and I were self-taught mages and my start-up was mandatorily awkward, running Bog Imps and Ironroot Treefolks alongside Air Elementals because hey, three-color Magic with exclusively basic lands was just pro. But we would evolve. I progressed as I carefully studied game progression, board states and tactics and practiced strategies and builds. I was able to change gears consistently as I learned that having profitable trading in your skillset was a valuable asset. My friends and I became avid casual players, spending most of our spare (and not so spare) time on it. 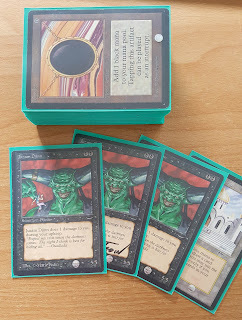 An era of Xeroxed card lists with rarities, Inquests, some Duelists and just plain old moments of ‘going-through-trade-binders-and-be-amazed’. During those days we summoned armies of Sengirs, Mahamotis, Doppelgangers, Juggernauts and Shivans. We’d terror, clone, balance, counter and bolt. We timed things LIFO. We’d interrupt. We’d tap continuous artifacts and blocking creatures. We played multiplayer games with 16 players and 4 simultaneous turns. We’d argue and laugh but above all wreak havoc and spread mayhem! Back then I already had a strong preference for those lovely older cards, but had to face the inherent difficulty to attain them. I disliked the look of fourth edition (no magic present there to me) and heavily sought after Revised and the early expansion sets. 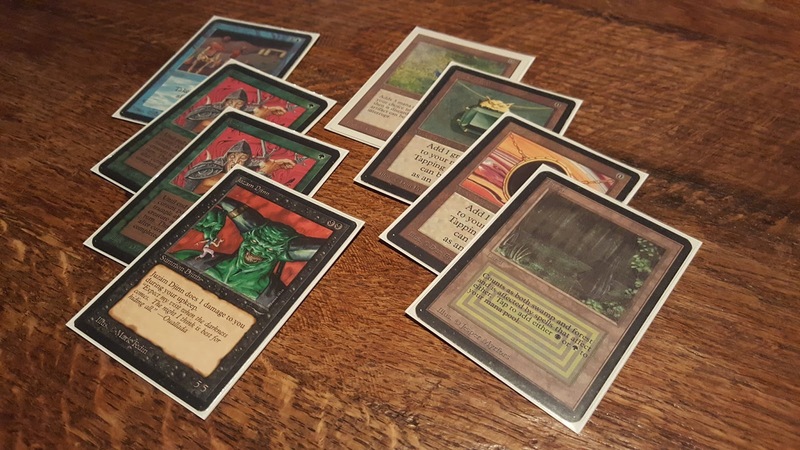 There were only a handful ABU cards in circulation in the group of friends that I played with. The few that I owned were attained externally from nearby gettogethers in community centers and a handful of tournaments. Some antique cards had to be overpaid for heavily, but who cared? After all, those were awesome. The cards were finally safely stored somewhere late 1999 when college started. The playgroup split up and my mana got too scarce to keep up. But although tucked away for years, Magic was never out of my heart. Every now and then I’d glance at the cards with inherent feelings of nostalgia. But the then-new (sixth edition) ruleset, the huge amount of new cards/meta and above all lack of fellow players discouraged me to return. Years later, I once again tapped into the nostalgia. As I started to generate some disposable income I got hooked on purchasing cards off Ebay USA, which was both fun and exciting. I also got to take full advantage of the then favorable Euro-to-Dollar ratio. 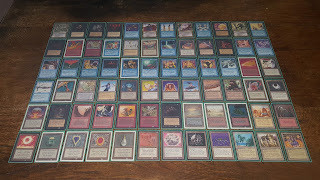 During a period of 6-8 months in 2005, 2006 I acquired quite a lot of staples from the early days: a Library, Juzam Djinns, Serendib Efreets, Berserks and loads of Unlimited Duals. Underground Seas were only around 25-30 euros at that time. Eventually I eliminated all Revised and newer cards from the deck – “Wouldn’t it be nice to play these old cards exclusively?”. Little did I know that not much later – about a thousand kilometers from my hometown – this concept would actually become a format. After that buying spree, the cards were once again tucked away for a decennium to come. Within that timeframe, I only made a big 40+ Revised dual land trade (somewhere around 2011) towards 6 pieces of Unlimited Power, but didn’t play or acquire any other cards. It wasn’t until 2016 that they would see the light of day again. 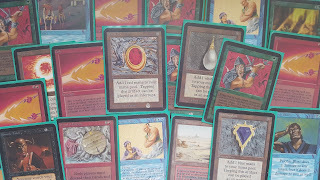 Things got rebooted when I told my girlfriend that I owned a considerable amount worth of old cardboard, which she initially could hardly believe. Together we dusted off the card boxes, looked up some values and learned that prices had exploded. A little research showed this was because of some format called 93/94. I immediately was intrigued. On request I learned her how to play and we’ve been bashing each others heads in with Juzams and Shivans on a regular basis ever since. Getting pounded by the Mrs. Early 2016 I started joining Facebook groups centered around old school Magic. 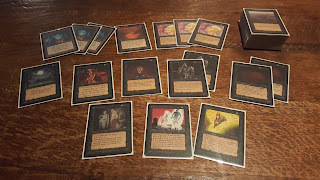 After a few months of lurking and researching I decided to jump on the bandwagon and seriously get into old school: halfway 2016 I started to purchase pieces of Alpha and Beta Power and began replacing white bordered cards with black bordered, preferably round-cornered cardboard. A year later I had assembled half a dozen Göteborg-legal decks and about the same amount that contain revised reprints. To me, playing these old cards is just immensely pleasurable. 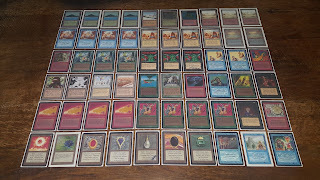 I’d like to go over two of the decks that I run in 93/94: “Big Zoo” and Old School Commander. I’ve always loved the butchering effect of Berserk. Back then it was restricted and it had to be either luckily drawn or tutored for and required assistance of Growths for lethal application. With Berserks stacking power exponentially, Fork seemed its perfect counterpart, but was restricted at the time too. Nowadays, things have changed for the better, especially with the unrestriction of Fork in the 2016 Ban/Restriction-update. 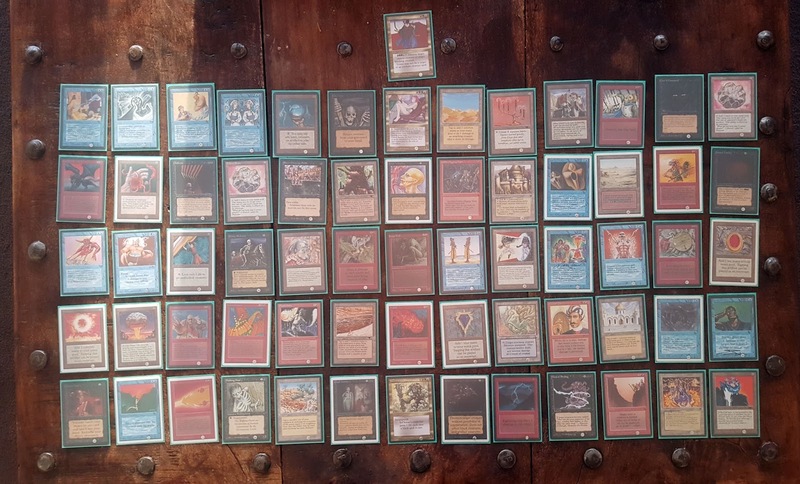 This 93/94 deck is centered around a Djinn/Efreet theme and is based on midrange to big creatures, backed up by Berserks and Forks. The objective is simple yet geniusly evil: summon a large beast early on, double-zerk it, silently pray for a no-plow and have it swing for lethal. Profit! Fork, the versatile card that it is, can either be used to go for the kill copying Berserks, provide general support by cloning powerhouses such a Recall, Walk and Tutor or mimicking an opposing Mind Twist or Mana Drain. This deck is intended as a somewhat viable 93/94 version of cards that are historically iconic and of nostalgic significance to me. It’s an old school incarnation of the cards that I played when I was young, or wanted to play but could not afford. It’s far from original: it runs the same base as most 93/94 decks using duals, Cities and Factories plus a lot of the commonly found restricted cards such as the Power Nine, a Library, a Twist and a Tutor. Besides that, it’s a somewhat unusual brew though it contains a lot of the staples that are common to the format. It’s by no means constructed as a competitive deck. With its four colors and solid amount of double-color casting cost cards, it has a fragile mana base that is vulnerable to both land destruction and Blood Moon. It has flying creatures but Moat still weakens its creature base (and therefor win con) significantly. The Abyss is an outright nightmare. King Suleimans’ ‘errata’ against this deck is basically “Tap to destroy any of opponents’ creatures”. It has a very limited amount of removal: just a Bolt and a Blast. I’ve never liked sideboarding so there is none (pro). Orchestrated hand for some 93/94 first-turn kill shenanigans. It has fighting chances though. The creatures themselves pack punch when not swiftly dealt with, are efficient (though some at the expense of their master), cannot be bolted and come in fair numbers. Its four colors allow it to run quite a few of the restricted power cards and although it lacks early game creatures – such as Kird Ape like in classic RG or RUG Zoo – it can still curve out from turn 2 onwards. The set of Forks gives the deck a versatile twist to it, that can swing either way. A cozy gathering of Djinns, Efreets, Troll and Dragon. “What are these doing here?” – Just some sinister cardboard. Lately I’ve been playing Magic with a playgroup of five to six players, most of them in their early to mid-thirties. 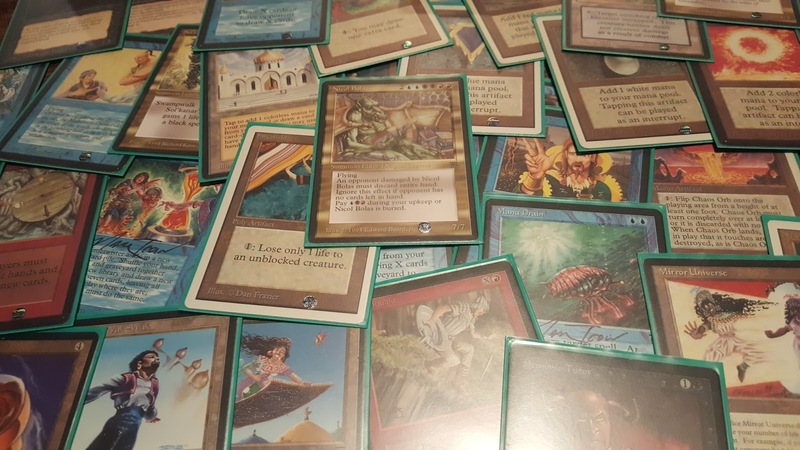 I joined the group about six months ago, when their recipe was Modern and regular – though quite competitive – multiplayer Commander, incorporating the Legacy ban list to rule out some of the most broken cards. I introduced them to 93/94, told them about the laidback yet flavorful format that it is, and cautiously tried to enthuse them for it. I was excited and quite surprised to witness one of them shortly thereafter assembled an old school deck (white weenie) with modern printings. Others then quickly picked up the format too, starting with mostly reprints to try-out the format and find out firsthand what all the fuzz was about. 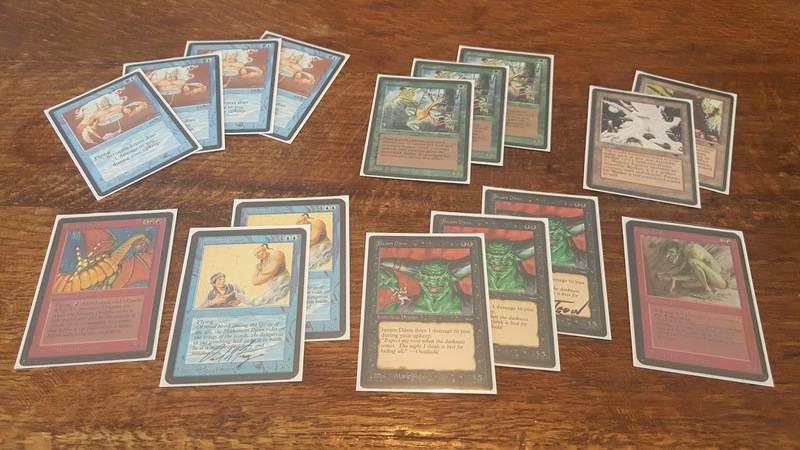 The old school snowball seriously gained momentum as things moved quickly from there: players were having a great time, started brewing multiple decks simultaneously and began replacing reprints with their older counterparts, whether it be Revised or actual Göteborg-legal cards where possible. They’ve been pillaging card stores all over The Netherlands and Belgium for months, depriving them of playable 93/94 cards. I’m quite sure there is not even an Unlimited Forest to be found anywhere in a 200 kilometer radius. 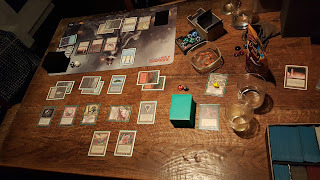 We started out playing free-for-all old school multiplayer in between regular EDH games, but also occasionally Two-Headed Dragon (2 vs. 2) and Emperor (3 vs. 3). A few weeks later 93/94 had basically become the new normal. Multiplayer 93/94 is a totally different animal. A Beast. And we love it! To make it more accessible we allow reprints, preferably same art, same frame. 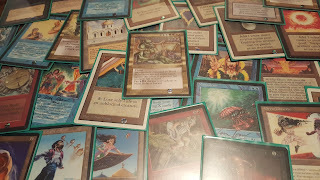 The fun the playgroup had building these decks, along with the plummeting prices of Modern, encouraged two of them to completely shift focus towards old school and transition by disposing of nearly all their Modern cards and buy old cards instead. Besides the obvious cool factor, a superior investment anyway. We recently changed gears by picking up a homebrew blend of two popular formats: 93/94 and Commander. 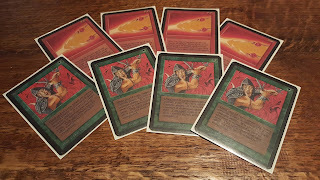 I figured it would be fun to integrate the two formats that we played, and on a Sunday afternoon I sat down and assembled a RUB 100-card singleton deck consisting of spare old school cards, lead by Tetsuo Umezawa. 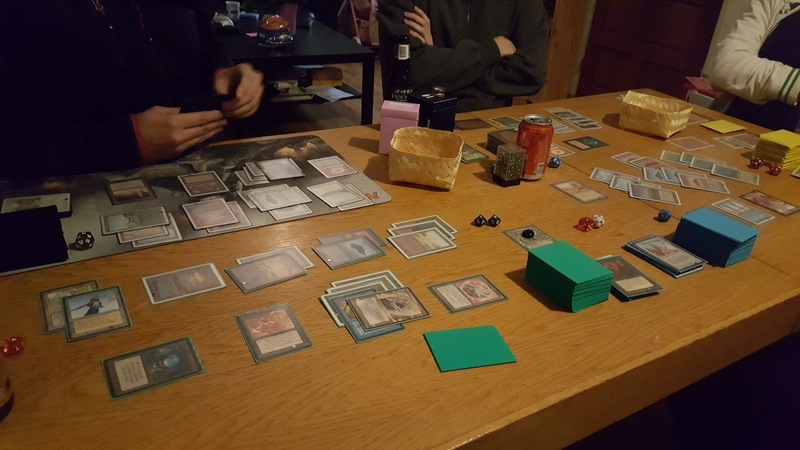 The idea for the deck was well-received by the playgroup, but the feedback I got was to play Nicol Bolas as general instead, and make it truly EDH. 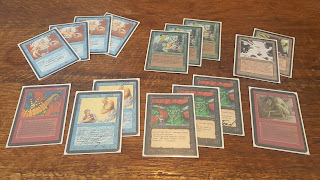 Plans were forged and that very same night the five Elders were distributed among the playgroup: 93/94 EDH, or Old School Commander, with the actual Elder Dragons was born. Getting closer! Notable cards missing are Guardian Beast and some pieces of Power. 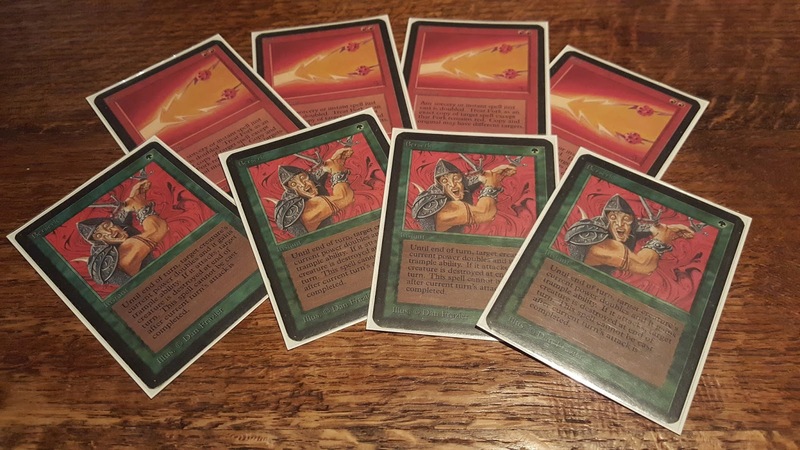 One of the facets of building this Old School Commander deck that really appealed to me is that there is basically zero information to be found on the web that applies to this format. Insights about strategies or card strength that are common knowledge in two-player 60-card Magic hardly hold any truth here. There are no primers, no posts, no discussions, there is no net-decking: as far as card selection is concerned, you’re on your own. 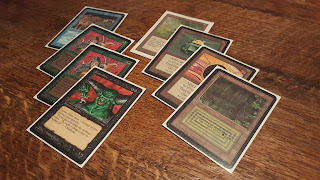 Looking at cards through these different eyes puts it all in such a different perspective: I literally had to go through all of the cards of the old sets again to assess and reevaluate whether it was somehow significant on a five-player battlefield. The “Think big” EDH credo surely is in effect here. This process of trial and error, finding synergies, sharing ideas and cards with fellow players reminds me a lot of Magic in the early days. It’s awesome! 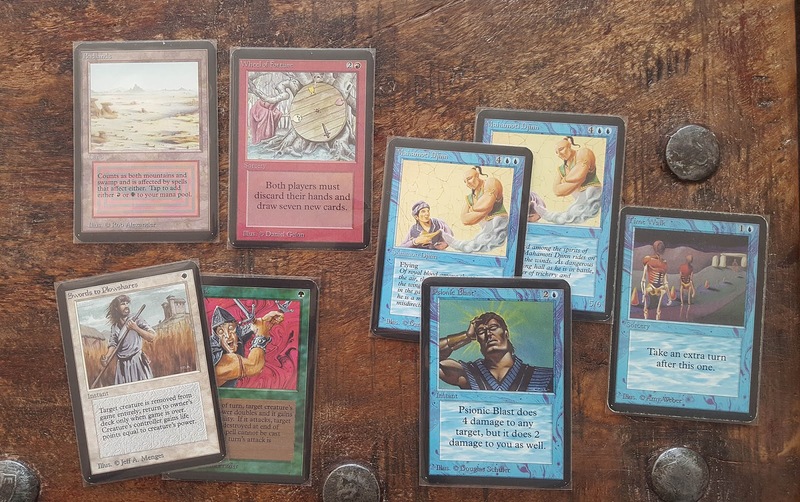 I do not wish to spoil it for anyone who wants to give Old School Commander a try, so I will talk some cards and tech – but hopefully only just enough to raise some curiosity – and by no means will try to unravel its magic. 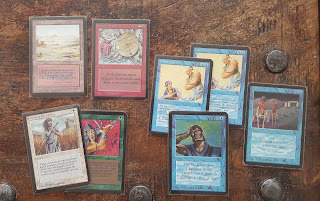 Nor would I claim I would be able to do so anyway, as we are still brewing, experimenting and learning ourselves: to us, Old School Commander so far has been very much a living, evolving thing. 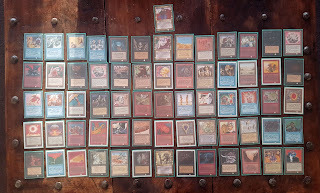 Three-color EDH with the 93/94 card pool grants access to a little over 400 cards in the appropriate colors, accompanied by about 150 artifacts and 50 lands to choose from. With 35 to 40 basic lands in the deck, this basically implies you play with 10% of all cards available to you. This singleton approach with such a limited card pool imposes some interesting restrictions and forces you to make some funky decisions. As themes (such as tribal), specific archetypes and combo are hard to pull off with so little available cards, you’ll most likely end up playing good stuff (although this does by no means imply you can bluntly ignore synergies). Therefore, you tend to see many of the same cards although played in different color variations. Even though the circumstances in singleton multiplayer are fundamentally different, a lot of the same deck design principles such as card advantage, permission, evasion, removal and threads, still apply. A mellow early game board – The calm before the storm. I found that the distribution of strength between the colors turned out differently than in regular non-singleton, two-player games of Magic. Some colors have a strong top-end, but the curve then quickly spirals downwards. Mono black for example is widely considered quite strong and versatile and as such I had high expectations of it in Grixis, but with only one-offs I quickly got the feeling I had to resort to suboptimal choices. The same is true for Red – sure, it has a few bombs, but – burn nor aggro strategies are nowhere near as effective in multiplayer. Green on the other hand, in old school by itself generally is considered a relatively weak color and is mainly viable as a support color, has a broad range of effective tools – both offensively and defensively – and multiplayer powerhouses. Desert Twister is a well-known versatile removal spell, but Powerleech and Urza’s Avenger are probably cards you’ve never even remotely considered playing in 93/94, but we consider auto-includes here in Old School Commander. It’ll come as no surprise that this is where Greens passive-aggressive artifact hate really shines: Citanul Druid, Titania’s Song and the beforementioned Powerleech and Urza’s Avenger all are beasts in this artifact-heavy multiplayer format. All-round it’s a surprisingly strong color. White as expected, does particularly well in terms of board control and spot removal, mostly with cards that are already staples in 93/94. Some notable lesser-played cards are Angry Mob, Preacher and Argothian Archaeologist. 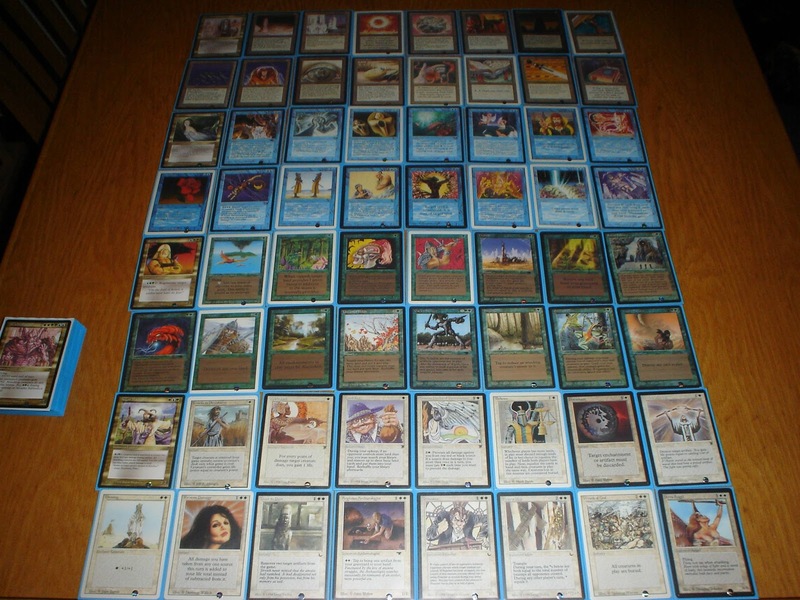 Blue, even in singleton, is every bit as strong as you think it would be: it has a powerful (and often redundant) array of tools that facilitate countermagic, copying, theft, bounce, draw, recursion and even tutoring. Truly a force to be reckoned with, but a sight to behold. A game of Old School Commander unfolds slowly and can easily last 4 hours, especially when all five Dragon are represented and well over a hundred permanents on the board. These games are intense and challenging! A typical midgame board with 3 out of 5 Dragons online. Asmadi ironically fighting by my side and swinging at its former master – forcefully fallen prey to mutiny, made possible by Control Magic and Fellwar Stone. Looking at 160-200 enemy points of life as opposed to the regular 20, going the purely aggro route is not a viable strategy in multiplayer Magic. Therefore, defensive measures must be taken. Luckily old school has quite a lot to offer in that area, especially when speed and mana cost isn’t of significant importance. Tawnos Coffin, Maze of Ith, Island of Wak-Wak, Icy Manipulator and Horn of Deafening all provide proper color-neutral protection against blood-thirsty Dragons. Having your defenses up generally results in opponents attacking alternate players instead, which in turn – more often than not – leads to retaliation of sorts, which is icing on the cake. The number of available Tutors can easily be counted on just a single hand – the relevant ones being Demonic Tutor and Transmute Artifact – which is exactly in line with what EDH was originally intended to do: bring variety back to the game and have it last longer than just a few turns. The lack of tutors certainly emphasizes the requirement for versatility in cards and might persuade you to play Fissure over Stone Rain. 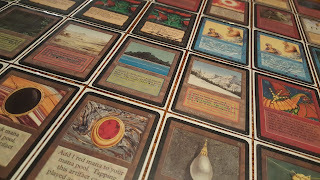 I really fell in love with the artifacts in this format and cherish their wide range of application. I currently play around 20 of them. Al-abara’s Carpet singlehandedly stops hordes of ground creatures in their tracks at the expense of 5 mana. Jayemdae Tome and Book of Rass (or, Book of Bas as we call it) both offer excellent card draw, the latter having a nice synergy with Mirror Universe. Candelabra of Tawnos both helps fixing your mana and allows utility lands to be reused (most notably Library, Maze, Valley and Wak-Wak). Obelisk of Undoing provides protection against permanent-hate (stealing, removal) and is great for reusability of cards like Triskelion, Tetravus, Sprit Link and Clone. Nevinyrral’s Disk is a great panic button and a thorough tool for breaking through stale game states. An Aladdin’s Ring carefully put in position is a lethal weapon and a threat on its own. Legends offers some very flavorful and playable multicolor legendary creatures such as Tetsuo, Angus, Oakenshield, Gwendlyn, Halfdane, Soulsinger, Sol’Kanar, Hazezon, Ragnar, Rasputin and Xira. Some of which have found their way into regular EDH decks as well. The three-color Legends can really make your deck stand out as you’ll get to be the only one able to play them. 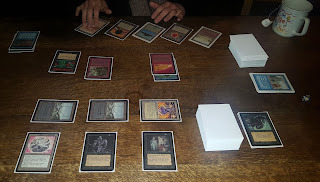 One-on-one game of Old School Commander. Gwendlyn and its Clone keeping both players at bay, for now. Although significantly less relevant than in two-player magic, mana acceleration is present but scarce. Even when running the traditionally rampy color green with Birds, Elves, Wild Growth, Ley Druid and Untamed Wilds. Besides Black Lotus and the Moxen, a Sol Ring, Basalt Monolith, Fellwar Stone and arguably Mana Vault are your best bets for decent ramping. The Mana Batteries of Legends actually are pretty useful too, especially when decharged into a humongous Braingeyser or Hurricane, or just for recasting that 12 mana general after it has been wiped off the board twice. Most color combinations offer plenty of spot removal for most types of permanents. Enchantments are exceptionally hard to deal with for nearly all colors, so choose your Chaos Orbs target wisely. Games are usually decided through powerhouses such as Angry Mob, Dakkon Blackblade, Mahamoti Djinn and, of course, the Elder Dragons. Mass-damage dealers such as Pestilence, Hurricane and Earthquake (but dodge that pesky Reverberation!) traditionally also have a dramatic impact to the players’ life totals and board position in general. Mass-removal like a Nevi Disk, Shatterstorm or Wrath of God can also instantly break players’ carefully put together defenses, leaving them exposed to threads. As a baseline, we honor the Swedish 93/94 ban and restricted list, and have it take precedence over the official Commander list. 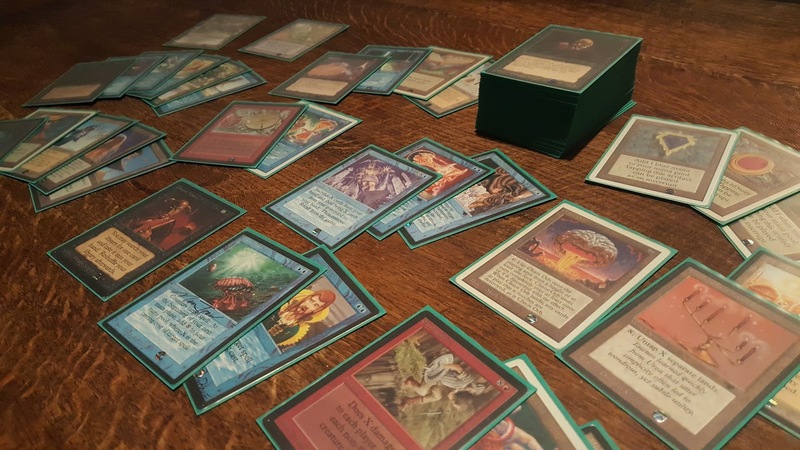 This means that certain cards that are banned in Commander, such as Chaos Orb, Balance, Channel and the Power Nine to its fullest extent – in turn all cards that help define and characterize 93/94 – are absolute fine to be played. On top of that, we make up house rules as we go. 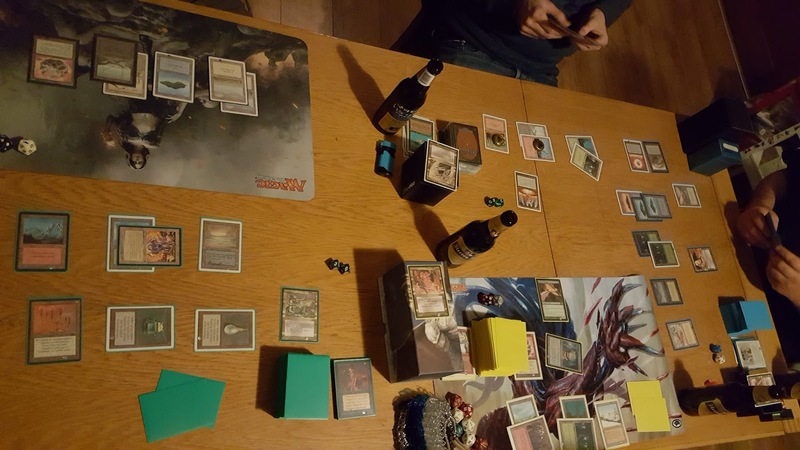 As a rule of thumb, we think everybody needs to be able to have a good time and we therefore tend to avoid cards that completely lock out the board (Winter Orb, Stasis) or that cripple or heavily penalize a single player only (we banned Mind Twist for just that reason). We also discourage mass land destruction such as Armageddon – since it’s already a slow format – and color-specific hate (eg. Flashfires and Northern Paladin). Land walking creatures such as a Swamp King are fine – when was the last time you used Hammerheim or Urborg for something other than mana? – an Erhnam can certainly pose some hilariously political dilemmas. An Abyss or Moat will not be appreciated. Balance – although it truly holds immense power – is played but Karakas is not. Michels “second brew“ Arcades deck. Nostalgia has always played a starring role in my deeply rooted fascination for Magic. 93/94 got me right back into the game after so many years. And I’m thankful for it. Special thanks also go out to Bas (Chromium), Michel (Arcades), Sander (Palladia), Thomas (Asmadi) and Niels (Ramirez DePietro) for facilitating playing epic games of Magic again. Although original print runs are limited for sure, there’s still plenty of room for others to pick up 93/94. Even modern day players that started much later might be interested in getting to know how it all started. I think Revised is a great “gateway set” to enter the scene on a budget, and still get to play cards of that era. The group I play with is an excellent example of how a small spark can set a Juggernaut in motion. Old School Commander has both flavor and depth and brings me joy on so many levels. I like composing decks with self-imposed restrictions, and getting to play such a diversity of old cardboard is just a blast. The Commander part of the format brings some political aspects into the game as well, and lends itself to negotiation and reasoning (read: blackmailing and trash talk). 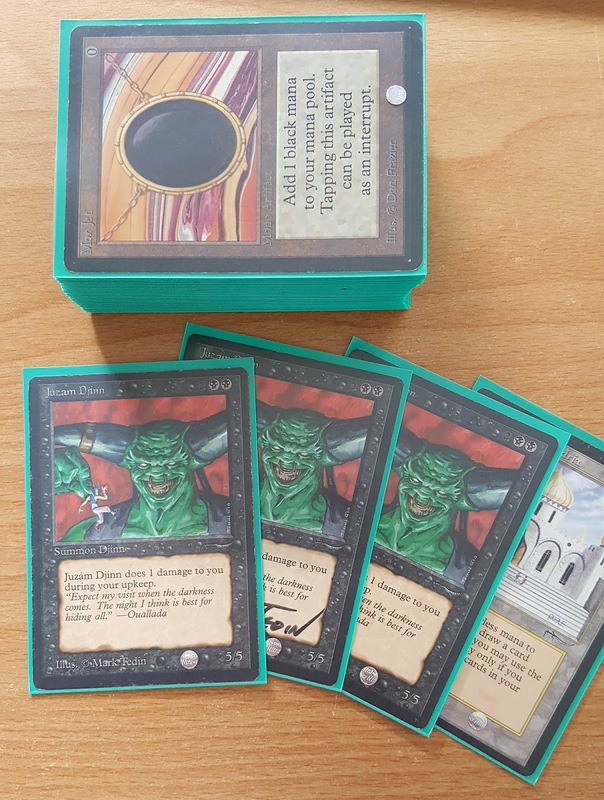 So for all you out there that have the luxury of multiple nearby Old School players: I dare you to sleeve up one-hundred cards of yore and try this one out! Im playing oldschool commander since quiet a while now and since noone else played it I was using the current EDH banlist from WotC in order to play against friends who are not into oldschool.